This PDF 1.6 document has been generated by Adobe InDesign CS4 (6.0.3) / Adobe PDF Library 9.0, and has been sent on pdf-archive.com on 08/02/2014 at 13:56, from IP address 98.221.x.x. The current document download page has been viewed 609 times. File size: 173 KB (5 pages). will be contacted by the Gumball team. and we are not obliged to accept your application. USA to finish in New York City! offset your carbon emissions with the appropriate authorities and provide us with evidence. lunches and dinners, as well as several parties. your request for a suitable extra charge. full on application to Gumball HQ. compete in any manner with other participants. 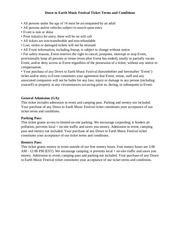 2010 in order to participate in the Event. transferable in any circumstances whatsoever. costs will be debited from your credit card. You must NOT consume alcohol while driving. 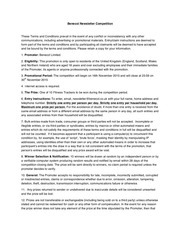 breach of these Terms and Conditions of Entry. removable without damaging vehicle finishes. manufactured elsewhere will not be accepted. sponsor information on a participant’s vehicle. not be entitled to a refund of your entry fee). compensation or refund of your entry fee. 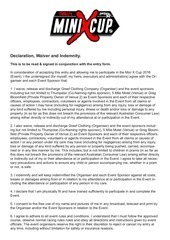 The Organiser requests you sign at the bottom of this page to show that you have read, acknowledged and understood Clause 18 specifically. further participation in the Event. entry fee will be made. 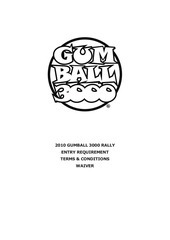 Gumball 3000 Films Limited’s sole discretion. any television programme without first obtaining the prior written consent of the Organiser. photgraphs taken at the Event. website or in printed materials without obtaining the Organiser’s prior written consent. 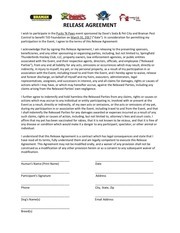 from the terms of this Agreement. parties whether in oral or written from. accidents that may occur during the Event. the hazards of travelling are to be expected. risk of driving through inclement weather. damage, or injury (including death). 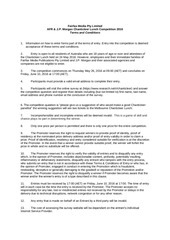 of entry, but cannot guarantee that the participants will abide by these terms and conditions. liability to the greatest extent allowed by law. This file has been shared by a user of PDF Archive. Document ID: 00145833.